Home » Blog » What are Enfleurage Essential Oils? Enfleurage is an old technique used for extracting essential oils from the most delicate flowers and this includes some of the oils that we sell here at Artisan Aromatics like Frangipani, Gardenia, Jasmine, Lily, Rose, Tuberose and Lilac. Enfleurage is a very old technique of extracting the aromatic oils from flowers that was popularized in France during the 19th century. It works on the simple principle that fats dissolve essential oils and thereby absorb their aromas. Petals and other fragrant plant parts are soaked in fat or vegetable oil which absorbs the fragrance. In the 19th century and early parts of the 20th, pork, lard and beef fat were used though now most of the world’s few producers use vegetable fats like palm oil. 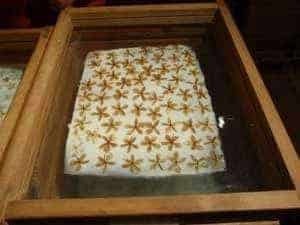 In the early days, the animal fat was smeared on glass plates in a wooden frame called a chassis and then the flowers were placed on the fat and left to release their oils for several days. The process was repeated several more times with spent flowers being removed and fresh flowers being added to the plates until the fat on the plates was completely saturated with the aromatic oils of the flowers. The oil saturated fat, called a pomade, was then dissolved by alcohol. The aromatic oils migrate to the alcohol and finally the alcohol is evaporated to leave the pure aromatic oil of the flower. The process is the same today except that vegetable oil is often used instead of animal fat. The resultant essential oil extraction is technically called an “absolute” but the term is deceptive since most products called absolutes are extracted in a different method by chemical solvents, such as hexane. Our supplier of absolutes extracted by enfleurage uses only organic palm oil and organic sugar cane alcohol in the extraction process. Enfleurage is used on certain flowers because their fragrant compounds cannot be extracted by distillation. Today most essential oils extracted from flowers that are too delicate for steam distillation are done so by solvent (chemical) extraction but, of course, the resultant oil can no longer be considered organic and there is always a hint of “chemical” smell to the aroma of the oil. Today only a very few few producers use the old technique of enfleurage because it is quite labor intensive and therefore quite costly but the exquisite results are truly worth it. Just one drop of Frangipani Absolute, Jasmine Absolute, Gardenia Absolute, Lily Absolute, Rose Absolute, or Tuberose Absolute oil added to an appropriate diluent makes a wonderful perfume. In addition to the extraction process being labor intensive, a lot of plant material is needed to produce the oil. In one study, 1000 kilos of Tuberose blossoms yielded only 801 grams of oil. Our partnering farm grows Gardenia and extracts the oil by enfleurage using organic and locally sourced Coconut or Palm oil. 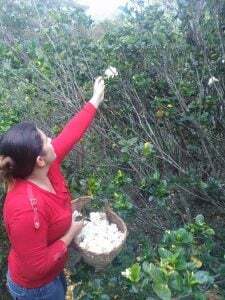 Here at Artisan Aromatics, we work closely with a small producer in South America that uses a modern version of the ancient technique of enfleurage to produce completely organic oils of Frangipani, Jasmine, Gardenia, Lily, Rose, and Tuberose. He grows his flowers on his small farm and then processes them using Palm oil as the fat and pure alcohol derived from local sugar cane. By using all local products, he helps to support the local economy and small farmers and gives employment to indigenous residents. 2017 Update: This producer has recently begun making Limited Edition batches of some Enfleurage Oils based on pure Organic Coconut Oil, rather than Palm Oil. 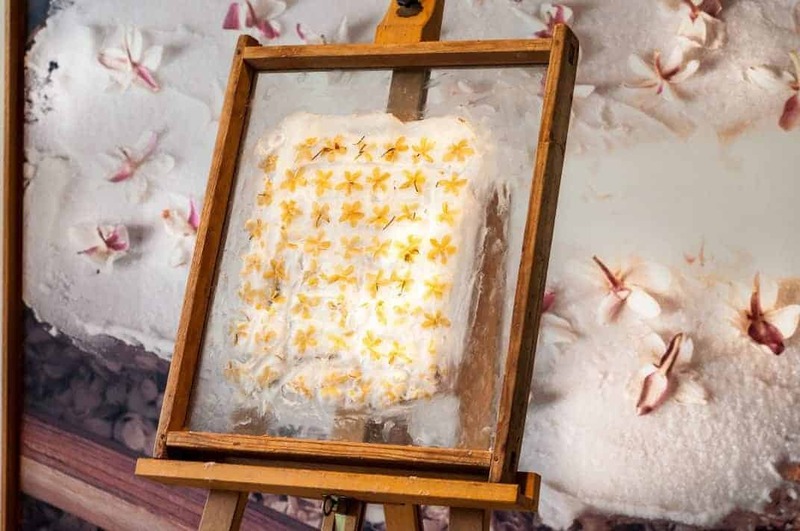 The result is very special – pure flower aroma without even a hint of the earthy undertone of Palm Oil. Check out all our Enfleurage Oils. Update: Our production facility in South America has begun making batches of our Enfleurage Oils using pure Organic Coconut Oil, rather than Organic Palm Oil. The result is very special – pure flower aroma without the hint of the somewhat earthy undertone of Palm Oil: our line of Limited Edition Enfleurage Oils. Wonderful article and very helpful comments. What is the best method of extraction for Blue Lotus flower? Do you know of anybody who produces Blue Lotus enfleurage? Or do you know its original/ancient extraction method? Also a retiree from Canada, three years ago I came back to my native country, Rwanda, where I can be more actively useful during my last years in life. I grow flowers now, and among these I have a small plantation of Tuberose now blossoming in profusion. But, alas, I don’t know how to extract oil from them! In your opinion, is there an easy and quick way I can learn fast the technique of enfleurage, and at a very limited scale just to get to know the art? I would very appreciate your advice. Good to hear from you. The few people in the world who now produce enfleurage oils are understandably very secretive about the exact process, which is fairly complex and not something you could easily do. Once the vegetable oil is impregnated with the essential oil from the blossoms, the vegetable oil must be dissolved with a solvent (in the case of our products, that solvent is organic sugar cane alcohol) and then the solvent must be evaporated in a manner that leaves the essential oil intact. No one talks about exactly how they do this and in many cases, the process has been handed down within families. A few books were published on the subject in the 1800’s (mostly in French, but at least one in English) and you might be able to find some of these if you have access to a good University library. You cold easily try an aromatic infusion by putting blossoms in a jar (tightly packed), covering them with vegetable oil and letting them stand for a couple of weeks but infused oils do not have a long shelf-life. Good luck. Thank you so much for responding, Mark. Ivan has been talking with Charl-Pan and she is indeed very helpful. Francois’s question had come in shortly before we found Charl-Pan and until she started sharing information on the process, the details were hard to come by. I had not seen the videos until you mentioned them and they are indeed very helpful. This is such a wonderful and generous sharing of information and my hope is that we will start to see more artisans exploring this method of extraction. Charl-Pan’s lilac extraction is just divine! Thank you for your helpful reply. Your kindness in sharing this information is appreciated and I encourage our customers to visit your website and learn about your natural perfumes … they sound wonderful! (To go to Afredo Dupetit’s website, click on the name in the above reply). Thank you for the comment; I am thrilled that you were inspired by the article. We would also like to learn more about the method but producers guard their secrets closely. Ivan did find some useful information by searching 18th and 19th century perfumery texts at our university library (some in the rare books section) and since enfleurage reached its highest development in the Grasse region of France, I suspect that a trip there and a visit to some French libraries would also be worthwhile. Good luck – I’ll keep you in mind if I run across any further resources. Dear Ans: Thank you for your question. There is no way to completely remove all traces of the absorbent oil from an enfleurage extraction. When palm oil is used as an extracting agent, the traces that are left in the final product add a subtle earthy note to the essential oils, although to my nose this note diminishes when the product is applied to the skin as a perfume and begins to interact with the natural oils found in the skin. When coconut oil is used, there are also traces left but the initial aroma seems very slightly closer to the aroma of the natural flowers than it does when palm oil is used. Since most of the flowers that are extracted by enfleurage will not stand up to distillation this is not an option for getting a pure essential oil but some of these flowers may be available as CO2 extractions, which are sometimes even closer to a plant’s natural aroma than are essential oils. I hope this helps. Best Wishes. Thank you for this lovely article on Enfleurage. It was one that inspired me to transform my lilac farm into becoming the only producer of Enfleurage in large scale proportions in the US. This year we produced 40 pounds of a 30 day enfleurage of lilac pomade. We sent 5 pounds of our pomade to a processor in Columbia South America, who processed it into the essential oil or absolute of lilac. It is a magnificent, exquisite scent. I would like to learn this step and be able to make the absolute from the pomade that we produce. Our chemist in Columbia will not share his methods, even though I have offered to pay to learn. Can you help me find a school or apprenticeship where I may learn this technique of processing pomade to absolute by hand-artisan methods? Thank you.